Shirley Jaffe (b. 1923; lives in Paris) is one of the most accomplished American abstract painters of her generation—yet she has never been included in a Whitney Biennial. 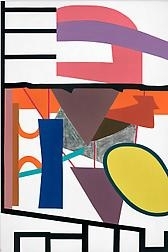 A small retrospective of Ms. Jaffe's large-scale signature paintings—of her ebullient, flat geometric shapes, lines, blobs and squiggles on generous white grounds—confirms that she has been successfully mining hard-edged abstraction for more than 40 years. Ms. Jaffe's paintings, reminiscent of Leger's circuses, Matisse's cutouts and Mondrian's Neoplasticism, provide ample breathing room, allowing her playful geometries to evolve and take flight—to feel both dancing across and embedded within their ground planes. Ms. Jaffe's forms and hieroglyphs amount to imaginative meditations on the elements and nature of painting. In "The Gray Center" (1969), forms flit among figure, ground, armature and spine. In "Four Squares Black" (1993), a universe of energies and elements is adjacent to an abstract window or stage. In "Birds" (2009), her forms suggest sun, cloud, ladder, worm, nut and tree; we're given the bird's flight, pictograph and plumage. In these paintings, Ms. Jaffe evokes the essences and building blocks of the world. She effectively transforms her pictures into something akin to theaters, game boards, chalkboards and wombs, arenas in which things are never fully formed but, rather, always becoming.